I am so enamoured with the Sweet Millions New York Lottery commercials. 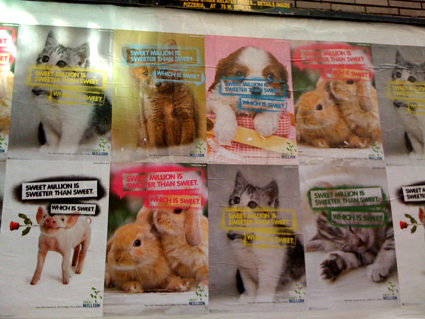 There are billboards with puppies, kittens and bunnies all over New York city. Too much cute. I tried to find the song in the bunny commercial but it seems it was written just for the commercial and the little bit in the commercial is all there is. The one where they are sleeping creeps me out a little, but I love the one at the carnival. a slightly more recent comment on youtube said: "I emailed NY Lotto to ask them about it. This is what they say. "The song was written specifically for that TV spot, composed and produced through Beacon Street Studios. The lyrics and tunewere written/composed by Andrew Feltenstein and John Nau from Beacon Street Studios, and the singing talent was Daniel Dunlap and Stace Steinmeier." LoosinIt said: I finally heard the lyrics correctly. The last part is "I'd tell you So-Soft, that I wouldn't share with anyone but you, "So Soft, So Soft." all they look very cute, unimaginable they are really a sweet million of trues I would say, I wonder if I could have all at home but there is not space in it.